The Pillars of Eternity II: Deadfire Fig campaign took about 25 hours to reach its first stretch goal after funding. This time Obsidian were ready with an update announcing the next two stretch goals. If the campaign reaches $1.6M of funding, they'll increase the game's level cap from 16 to 18. Josh Sawyer explains, and also offers some details about the game's multiclassing system which are relevant to the next stretch goal. Greetings. I wanted to write up a brief summary of what an increased level cap will do for Deadfire. I also wanted to explain how companion classes work, especially with regard to multiclassing. The default level cap in Deadfire is 16, which is where Pillars of Eternity wound up after The White March was released. Raising the level cap to 18 will grant access to an entirely new level of abilities for all classes, from barbarian to wizard. 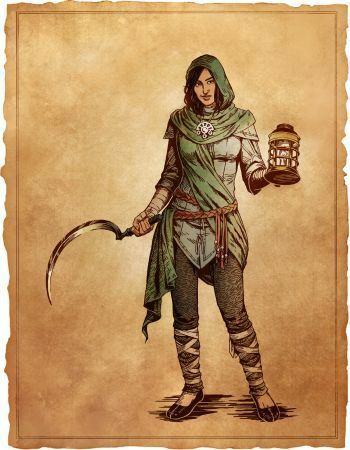 At $1.8M, Obsidian will add a new, seventh companion to the game - Xoti, a Readceran priest/monk. She's part-Ixamitlan, hence the unusual Aztec-flavored name. There are five companions in the game's title artwork, so I wonder who the sixth one is.